One evening last summer the dogs and I were on the beach near our home. 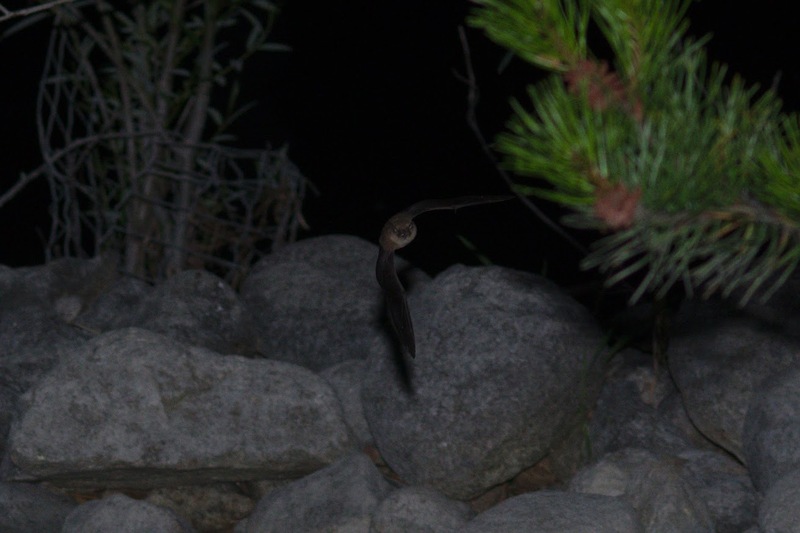 Just as it got dark a group of bats came out of the brush and flew back and forth along the shore feeding on the mayfly hatch. Of course I wanted to get a photo. So began the saga. I learned an enormous amount, spent a substantial sum, and now want to describe it for posterity. I chanced upon a location where a small number of bats are concentrated in a small area making it possible to get a photo. 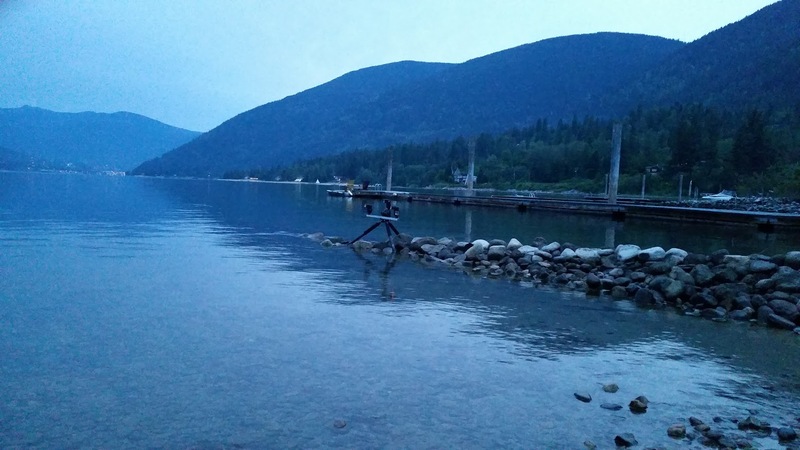 The beach was enclosed on one side by bush, the other by a dock. 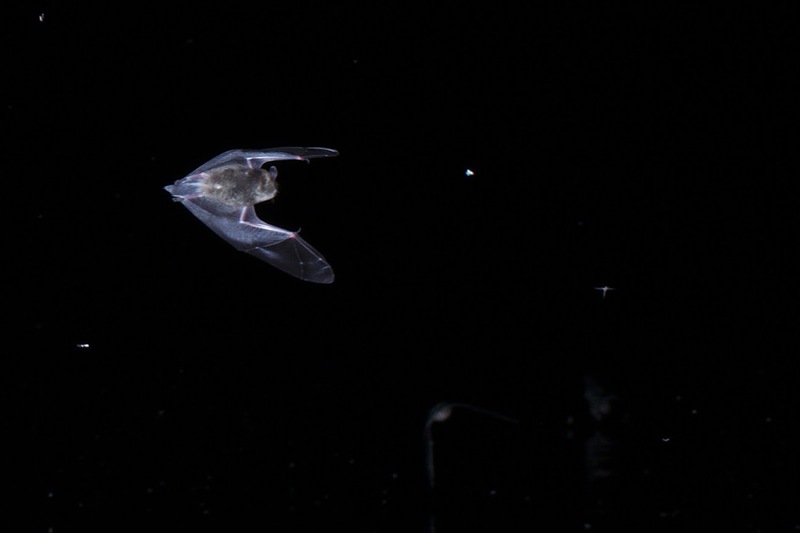 The access to the beach was a trail, and it seems that bats either head for open space or feel their way by following a boundary of some sort. So during the time of peak activity, about 15 minutes just as it got dark, there was a certain density in the air main it possible to capture the odd one in a frame. Another advantage was if I sat in a particular location, I could see the bats against the western sky and the reflection on the water. 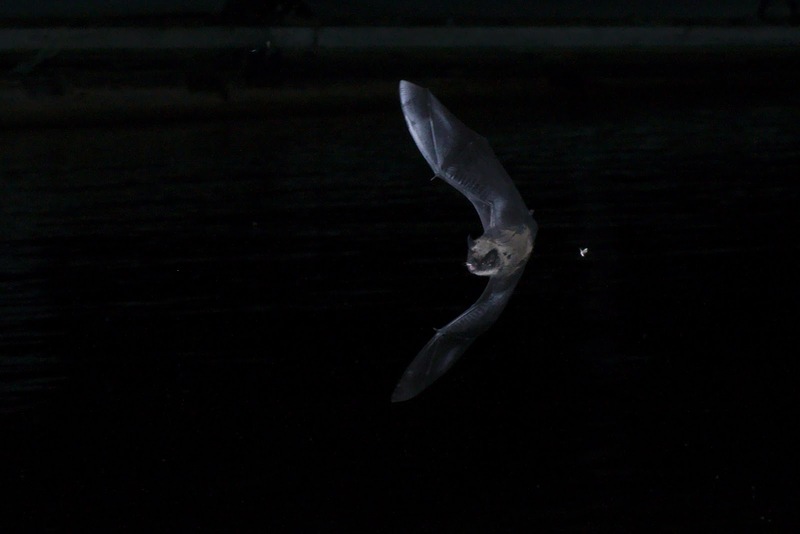 The bats stayed close to shore for 10-15 minutes then spread out over the lake. It is very dark, the subject moves very quickly in unpredictable ways. And they are small. To capture them in a photo requires artificial light, a very short exposure to freeze movement, and some way to point and trigger the camera to get one in the frame. Now for a lens. You can't focus in real time, they are too quick and you can't see them. So you want to set up a box in space that is in focus and illuminated. I tried different lenses; 35mm which had a wide field of view and captured lots of action, unfortunately was soft so the shots were unsatisfactory. 100 mm lens which was sharp but the area in focus was to far away to illuminate with the flashes that I had. Intensity of light decreases at a rate of the square of the distance. The box was too far away. A 50 mm lens seemed to give me the best results. Aperture? Here a depth of field table is useful (http://www.dofmaster.com/dofjs.html). Depth of field is the space in which the lens is in focus. A large aperture, or lower f-stop number gives a narrow depth of field. The closer your subject the narrower the depth of field. The longer the lens in mm the narrower the depth of field. For our purposes the further away, the shorter the lens and the higher the f-stop the larger the box where things are in focus will be. But the further away the more light you will need. The further away the smaller the bat will be in your frame. Same with a short lens. The higher the f-stop you may run into distortion as well. I found f8, focusing at 10 feet with a 50mm lens gave me a box about 4 x 4 3/4 x 3 feet. One flash isn't enough. I had three. One Metz 50 AF1 on the camera, and two Yongnuo 560ii manual flash units assisting. All on 1/8 power. This was the challenging part. There are a few ways to trigger multiple flashes. 1/4000 is .25 milliseconds. The Yongnuo units are a bit slower than that, but bear with me. Optical triggering, which I used takes .06 ms, or roughly a quarter of the total exposure time. Wireless radio triggers take about .25 ms to trigger, meaning that the master flash would be almost finished before the slave units would begin. 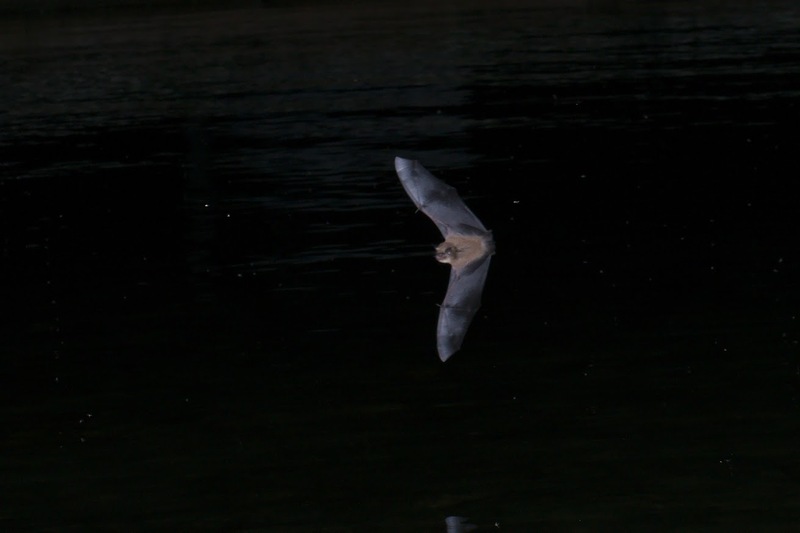 I noticed that the shots where the bat was flying across the frame were soft, possibly indicating too long of an exposure. That extra .06 ms may have been the difference. In any case speed is of the essence. I initially had the the flash units close together, but found that the images were unpleasant. 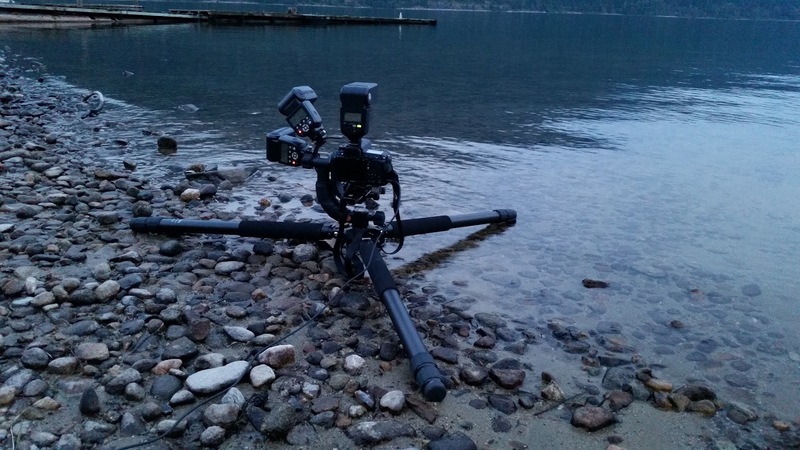 A 5 ft long piece of aluminum angle made a bracket with the camera in the middle and the flash units on either end. It made a very big difference in image quality. How to capture the varmints? I used a remote shutter trigger so I could sit where they were visible, then held down the button. I would take hundreds of shots and get maybe two dozen with something in the frame, and maybe one or two that were interesting. This pray and spray method has a drawback. The flash units need to regenerate between exposures, and will shut off from time to time to cool off, or to allow the battery discharge to catch up. I used Duracell precharged NiMH 1.2 v 2400mah AA batteries, freshly charged for each session. They worked very well. I have one set of Eneloops and found they didn't keep up with the Duracell's. Even then I would get dark exposures as one or more of the flashes missed. The solution is to shoot less. I learned discipline, which helped. I also invested in a trigger device, but ran out of time. 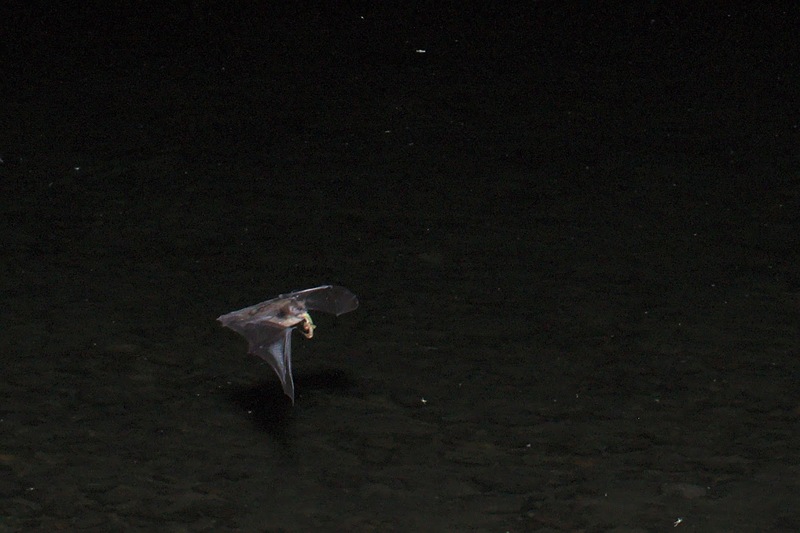 The weather changed, or the hatch changed and the bats stopped hanging around the shore. So next year. I am already planning and accumulating. Another two flashes. I will wire them together, getting rid of any latency. At the same distance I might be able to set them to 1/16 power. The wire harness is ready and tested. I need another support, which entails the purchase of a light stand. And I intend to test the trigger device to figure out how to set it up. I got about 80% of the way there. The shots are decent but not excellent. My goal is to get enough excellent shots where they are also doing something interesting. Just getting one was a challenge. Now to get a good one.